So That's Where Iran Is! 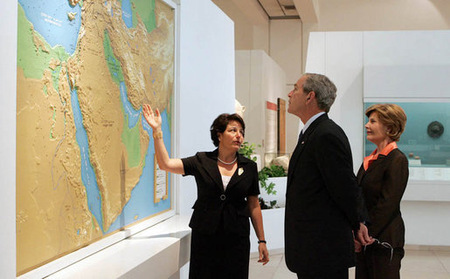 The longer Bush is in office, the more I feel like a conspiracy freak . . . but I do not take the latest National Intelligence Estimate that shows Iran is not, in fact, developing nuclear weapons at face value. My suspicion is that Bush, Cheney & Co. OK'd the release of the summary of the NIE in order to enable them to climb down from the precipice of war. I have been repeatedly skeptical about the seriousness of the administration's threats to launch military action against Iran. We don't have the military manpower; we don't have the support of the world, let alone the support of the American people; and such an action would plainly be detrimental to America's long-term national security interests. Even someone as obdurate as George W. Bush must see that. These realities didn't stop the administration from rattling the saber. The problem, though, was that its overheated war rhetoric was starting to create a political liability for the President and the Republican Party. If Iran was such a major threat, how could the President allow it to stand without seeming weak? How would his "legacy" look then? And how could other Republican Presidential candidates support a policy that both labeled Iran as a mortal threat to the U.S. and failed to do anything substantive about it? How could the U.S. military be kept on-message about the supposed success of the surge while at the same time the President appeared to be preparing to thrust them into an unwinnable third war? How could we secure cooperation of other countries on a whole host of issues--ranging from propping up the staggering dollar to fighting the Taliban in Afghanistan--if it appeared that the U.S. was hell-bent on attacking another oil-producing Muslim country? A National Intelligence Estimate showing that Iran no longer posed a big threat would solve all these problems. In effect, it would enable Bush to declare victory and get out. ultimately the president is the final arbiter of what information is declassified for public consumption, and theoretically could have thwarted the release of the new intelligence estimate. Since the administration could have prevented the NIE's release--but did not--the only conclusion I can draw is that it did not do so because its publication would help more than it would hurt. Bush will have to take a few lumps for being wrong on Iran--which he can presumably spin as erring on the side of caution in a post-9/11 world--but will now have a reason to back off his bellicose rhetoric and eliminate a number of problems that his warlike pronouncements had created. Then there’s the really bad news. Much as Iraq distracted America from the war against Al Qaeda, so a strike on Iran could ignite Pakistan, Al Qaeda’s thriving base and the actual central front of the war on terror. As Joe Biden said Tuesday night, if we attack Iran to stop it from obtaining a few kilograms of highly enriched uranium, we risk facilitating the fall of the teetering Musharraf government and the unleashing of Pakistan’s already good-to-go nuclear arsenal on Israel and India. A full-scale regional war, chaos in the oil market, an overstretched American military pushed past the brink — all to take down a little thug like Ahmadinejad (who isn’t even Iran’s primary leader) and a state, however truculent, whose defense budget is less than 1 percent of America’s? Call me a Pollyanna, but I don’t think even the Bush administration can be this crazy. [T]here is a real menace out there. An unstable country, with a military regime, religious strife, and an arsenal of nuclear weapons and missiles capable of striking Israel and our bases in Iraq and the Persian Gulf. And the name of this menace? Pakistan, the country in Southwest Asia to the east of Iran. In other words, just the Bush administration's fixation on Iraq caused us to lose sight of of al Qaeda and Afghanistan, so its current focus on Iran is causing us to divert attention from al Qaeda and Pakistan. So even if all this saber-rattling is just that, its consequences could be a lot more severe than further damage to Iranian/American relations. While we're all het up about a country that might have the bomb someday, the authoritarian ruler of a far more unstable nation that already has nukes has declared martial law and is dealing with a virtual insurrection. That worries me a lot more than Iran's nuclear program right now. Our President: "So I've told people that if you're interested in avoiding World War III, it seems like you ought to be interested in preventing them from have the knowledge necessary to make a nuclear weapon." Note where Bush has placed the goalposts here. Not preventing Iran from having a nuclear weapon. Preventing Iran from having the knowledge necessary to make a nuclear weapon. I'm not sure what the significance of that switch is, but it seems significant. Reports that the Bush Administration will put Iran's Islamic Revolutionary Guard Corps on the terrorism list can be read in one of two ways: it's either more bluster or, ominously, a wind-up for a strike on Iran. Officials I talk to in Washington vote for a hit on the IRGC, maybe within the next six months. And they think that as long as we have bombers and missiles in the air, we will hit Iran's nuclear facilities. An awe and shock campaign, lite, if you will. But the fact of the matter is that we don't have either the troops or the equipment to sustain our forces in Iraq--so where will we find forces to fight the Iranians? Surely even the neocons in the Bush administration understand this. Right? If this story about how hardliners in the administration (read: Cheney, Rumsfeld & Co.) deep-sixed a diplomatic offer of rapprochement by the Iranians in 2003 is ever substantiated, then it will represent one of the most tragically lost opportunities in U.S. diplomatic history. --Iran, a (soon to be) nuclear-armed and quasi-democratically-governed country with a large population, substantial oil reserves, and a strategic location in the middle of the Middle East. Iran is certainly the most problematic of the Three I's, but by helping to resolve those problems, rather than exacerbate them, the U.S. could do much to improve its geostrategic position in the world. Iran is certainly not a perfect democracy--but it is far more democratic than, say, Saudi Arabia, Egypt, Kuwait or Pakistan. There are elections at the local and national level, and while it is true that the Imans still hold substantial power in Iran, there is a strong popular desire for less theocracy and more democracy. Iran has supported insurgents in Iraq and terrorists elsewhere, but then since when has that stopped us from making an alliance? I hope that whoever occupies the White House come January, 2009 will have a clear long-term strategic view of American interests in the world and pursue them accordingly. The current strategy--blow stuff up and see what happens--has left us weaker and more isolated than at any time since the 1930's. The phrase "defining deviancy downward" (originally coined by Daniel Patrick Moynihan) has been used by social conservatives to explain how it is that behaviors that were once considered shameful, immoral, sinful or perverse eventually come to be accepted as norms. The idea is really a species of the slippery slope: once we accept one small deviation from conventional morality, we then find it easier to accept another, and another, and another until we find ourselves condoning all sorts of things that were once thought repugnant. --the torture of terror suspects. Once our government commits--and moreover, defends the commission of--kidnapping, extralegal imprisonment, and torture, then murder is only a hop, skip and a jump away. I'm sorry to see Glenn Reynolds come to this. His blog, Instapundit, was the first blog I ever read on a daily basis. I enjoyed his quirky mix of politics, nanotechnology, cars, cameras and music. I appreciated his advocacy of civil liberties. Even though I disagreed with him on various political matters, I saw him as just right of the center, a kind of guy with whom I could probably find a lot of common ground. Over the last five years, however, the center has been yanked sharply rightward by people who seem eager to embrace authoritarianism and discard the funadmentals of enlightenment democracy. This redefinition of what is commonplace, acceptable and worthy of consideration has gotten Reynolds and others to the point where their advocacy of the murder of scientists and Islamic theocrats is no longer deviant and shocking. In a country where we waterboard prisoners and lock people up without judicial review, murder no longer seems so terrible. I'm already on record for my belief that even the Bush administration would not be so deranged as to make war on Iran. I hope I'm right about that, but the signs are starting to look pretty ominous right now. Surely this is just a dream, a nightmare of our republic gone horribly wrong.